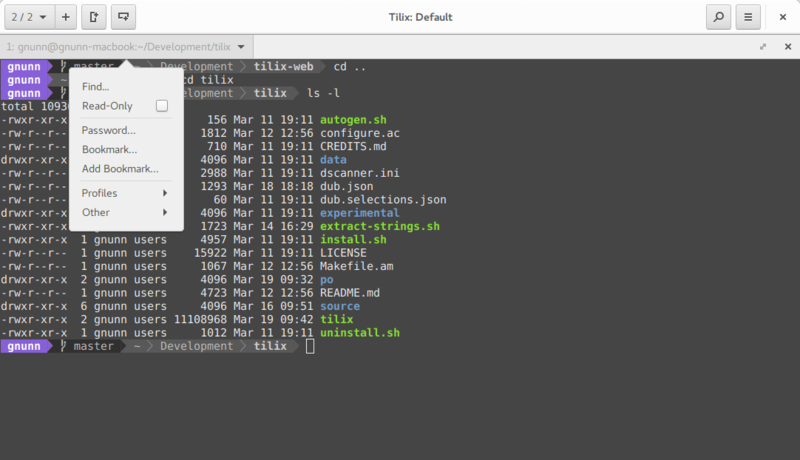 A tiling terminal emulator for Linux using GTK+ 3. The Tilix web site for users is available at https://gnunn1.github.io/tilix-web. This will export your settings from the Terminix key in dconf and re-import them into the Tilix key. Note that this will work even after you have uninstalled the Terminix schema, since the user customized settings are available even after the schema got removed, and the default settings are identical between the two and thus do not matter. If you are having issues with Tilix, feel free to open issues here in github as necessary. Developers and users can also be found on IRC on the freenode network in the #tilix room. Tilix is localized using Weblate, please visit the Weblate hosted Tilix translations site in order to assist with translations, please do not submit direct pull requests to this repository for translations. Tilix is written in D and GTK 3 using the gtkd framework. This project uses dub to manage the build process including fetching the dependencies, thus there is no need to install dependencies manually. The only thing you need to install to build the application is the D tools (compiler and Phobos) along with dub itself. Note that D supports three compilers (DMD, GDC and LDC) but Tilix only supports DMD and LDC. The application depends on various resources to function correctly, run sudo ./install.sh to build and copy all of the resources to the correct locations. Note this has only been tested on Arch Linux, use with caution. Note : install.sh will install Tilix to your /usr directory. If you are interested in installing Tilix to a custom location, you can specify the PREFIX as an argument to the install.sh script (e.g : ./install.sh $HOME/.local will install Tilix into $HOME/.local). However, this requires you to add your $PREFIX/share directory to your $XDG_DATA_DIRS environment variable. Note there is also support for meson, please see the wiki page on meson for more information. Support for autotools will be deprecated in favor of meson, for information on using autotools please see the wiki page here. Tilix is available as packages for a variety of distributions. This method only applies if you installed Tilix manually using the install instructions. If you installed Tilix from a distribution package then use your package manager to remove tilix, do not use these instructions.